The Navare Bible New Testament series give you the complete English (Revised Standard Version, Catholic Edition) and Latin (New Vulgate) texts of each book, plus extensive Catholic explanations of the scriptural texts and their implications for everyday life. Compiled by the faculty of the University of Navarre, the commentaries draw on a huge variety of sources: Church documents, the writings of the Fathers and Doctors of the Church, and the work of prominent modern spiritual writers -- chiefly St. Josemaria Escriva, who initiated this massive project. Each volume is self-contained, with wide-ranging general introductions, introductions to each Biblical book, a table of sources cited, maps, and informative notes. Scholarly and readable, these volumes are a comprehensive intellectual, historical, and spiritual survey of the riches of the New Testament. The third and final volume of the Reader's Edition series of The Navarre Bible New Testament combines the individual Navarre NT books and commentary into one convenient volume. 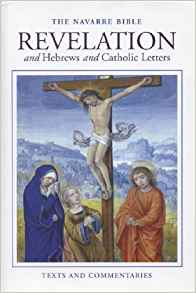 This edition contains: The Revelation to John (Apocalypse), The Letter to the Hebrews, and Catholic Letters (James, 1 and 2 Peter, 1-3 John, and Jude). It provides extensive commentary located on the same page as the scripture text. This facilitates quick reference, Bible study discussion, and easy reading. This volume also includes the Latin Vulgate translation of the Bible for reference at the back of the book.